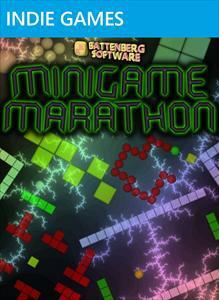 Minigame Marathon is essentially a combination of all the classic arcade style games we expect from an Atari. There are 30 different minigames that you play through to either beat the leaderboard time or just to compete with 3 of your friends. 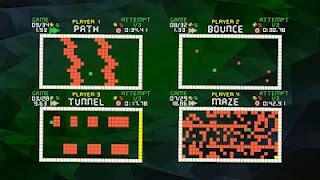 There are some instantly recognizable classics like pong, snake, and frogger along with several others. 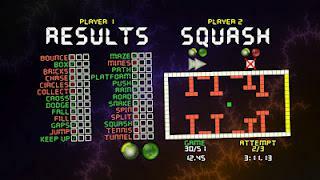 Now each of these games don’t actually use the trademarked characters they instead use dots and squares for each game. You play through 30 games and after you go through them all you get to go back and retry those games you failed up to 3 times before you don’t get credit for passing it. As mentioned earlier this game can be played by up to 4 people and in addition to having more players to the competition you can increase the difficulty of each of the games. Now Minigame Marathon is only 80ms points but is it worth the light of day?